Osmosis: Measuring renal plasma flow and renal blood flow. (2019, April 20). Retrieved from (https://www.osmosis.org/learn/Measuring_renal_plasma_flow_and_renal_blood_flow). Para-aminohippuric acid is used to estimate renal plasma flow because it is neither metabolized nor synthesized from the kidney and nearly all of the organic acid is excreted into the urine. Because the concentration of para-aminohippuric acid in peripheral veins is equal to the concentration in the renal artery, this can be easily sampled along with the clearance of it into the urine in order to estimate renal plasma flow. Renal blood flow is then calculated by dividing renal plasma flow by 1 minus hematocrit. Effective renal plasma flow often (overestimates/underestimates) true renal plasma flow by around 10%. Renal blood flow refers to the amount of blood that the kidneys receive over a period of time. Blood gets to the kidneys through the renal artery. Blood from the renal artery flows into smaller and smaller arteries, eventually forming the tiniest of arterioles called the afferent arterioles. After the afferent arteriole, blood moves into a tiny capillary bed called the glomerulus. The glomerulus is part of the functional unit of the kidney, called the nephron. There’s about 1 million nephrons in each kidney, and each of them consists of a renal corpuscle - made up of the glomerulus and the Bowman’s capsule surrounding it - and a renal tubule. Interestingly, once the blood leaves the glomerulus, it does not enter into venules. Instead the glomerulus funnels blood into efferent arterioles which divide into capillaries a second time. These capillaries are called peritubular capillaries - because they are arranged around the renal tubule. Now, blood filtration starts in the glomerulus, where an urine precursor called filtrate is formed. The amount of blood filtered into the nephrons by all of the glomeruli each minute is called the glomerular filtration rate, and it’s actually just a small fraction of the blood that gets to the kidneys, because the glomerulus doesn’t allow red blood cells and proteins to pass through and be excreted into urine. So right from the start, what passes through the glomerulus is mostly plasma - which normally makes up about 55% of blood. What is more, the glomerulus only filters about 20% of that plasma in one go. So when all is said and done, of those around 1.25 liters that the heart pumps out every minute, glomerular filtration rate is normally around 125 milliliters. That plasma-derived filtrate then enters the renal tubule. The renal tubule is made up of a proximal convoluted tubule, the nephron loop - also known as the loop of Henle - which has an ascending and a descending limb - and finally the distal convoluted tubule. As filtrate makes its way through the renal tubule, waste and molecules such as ions and water are secreted from the peritubular capillaries into the tubule, and they are also absorbed from the tubule back into the capillaries. The peritubular capillaries reunite to form larger and larger venous vessels. The veins follow the path of the arteries, but in reverse - so they keep uniting until they finally form the large renal vein, which exits the kidney and drains into the inferior vena cava. 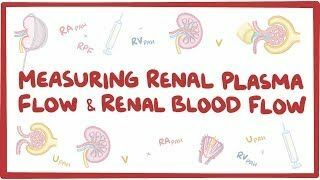 Measuring renal plasma flow is based on the Fick principle - which states that the amount of a substance in the blood that flows into an organ is the amount that must flow out of that organ, assuming that the organ doesn’t produce or degrade the substance. So what goes in equals what comes out, that’s easy enough. So to measure true renal plasma flow, the amount of plasma that flows into the kidney, we can use para aminohippuric acid - or PAH. That’s because PAH isn’t made in the body, so a known amount of PAH can be injected into the body. PAH is also ideal because it doesn’t alter renal plasma flow in any way. So, applying the Fick principle, the amount of PAH entering the kidneys through the renal arteries equals the amount of PAH in the urine plus the amount of PAH leaves the kidneys through the renal veins. So let’s puts this in the shape of an equation, which uses the concepts of concentration - measured in milligrams per milliliter of fluid - and flow - measured in milliliters per minute. The amount of PAH entering the kidney per unit time is equal to the concentration of PAH in renal artery blood times renal plasma flow - which is what we want to determine. The amount of PAH leaving the kidney per unit time is the sum of the concentration of PAH in renal vein blood times renal plasma flow plus the urinary concentration of PAH times the urine flow rate.